In the early 1990s, developer Jim “Scrappy” Edgemon discovered an exciting property on the Fort Morgan Peninsula, a sandy spit that forms the south eastern flank of Mobile Bay. His vision was to create a golf and beach resort that was complemented by a links-style golf course so he called in former US Open champion Jerry Pate to fashion an 18-hole layout for the new Kiva Dunes development. 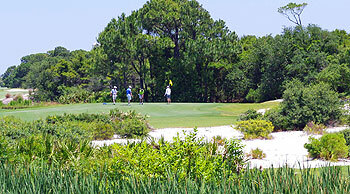 First opened in 1995, Kiva Dunes is testament to the two men’s shared love of golf and, twenty years after the course was unveiled, a one and a half million dollar refurbishment was carried out to upgrade all the greens and bunkers, as well as remove some of the trees that were hindering the agronomic integrity of the layout. The unique location of Kiva Dunes on a very narrow peninsula that separates Mobile Bay from the Gulf of Mexico means that ever-shifting winds make each and every round on the course different, depending on whether it’s the gulf or the bay breezes that are dominating. Highlight holes include the 541-yard 2nd (with the green positioned behind a small lake), the 576-yard right doglegged 5th (which features a number of large fairway bunkers), the 215-yard 17th (played across water to a very narrow green), and the 458-yard 18th, where the enormous home green is protected by an equally large bunker to the front right of the putting surface. The nearest Kiva is at least 2000 miles away (in New Mexico) and there’s not much in the way of dunes here either. What is here is a lovely golf course. Though water comes into play on 7 holes, only two require a forced carry. And half the holes require some strategic thought off the tee, deciding how much risk to take to get the most advantageous next shot. Strategy comes into play on approach shots as well—only five rove the option to play a running shot. And there is plenty of challenge once the green is reached. Every green has contours—none crazy, but each challenging. Golfers with an interest in art will be particularly appreciative of the beautifully sculpted bunkers. They are somewhat reminiscent of those on a Seth Raynor course, but not as angular and thus more natural looking. I was in a few of them and found the sand to be quite consistent. Kiva Dunes is a bit of a drive from Mobile (though the trip includes a boat ride) or out the Mobile Point peninsula from Gulf Shores. No matter which route one takes, it’s well worth the trip. When Kiva Dunes Golf Club opened in 1995 Golf Digest called it the #2 Best New Public Course in the U.S and it still ranks as one of the finest in Alabama today. This superb Jerry Pate design is a links-style layout offering plenty of forced carries over sand dunes, lakes and natural wildland areas. Manager Mark Stillings told me the course was closed for four months and reopened in November 2015 after spending US$1.5 million on improvements. Mark said they replaced the greens with Bermuda Tiff-eagle since it is much more heat, salt and wind tolerate. They also cut up the oak trees around the perimeter of the property and eliminated some of the “flashed-up” sand-walled bunkers for better ease of play. A word to the wise - the greens are still hard since they are relatively new and extremely fast with an average size of 7,500 square feet so bring your best putting stroke. Still my fondest memory is walking up on 18 and seeing the reflection of the clubhouse lodge radiating across the pond and knowing this was my view all week long. Kiva Dunes Golf Resort is the only golf and beach resort in Alabama offering an array of 2-4 bedroom well-appointed condos and 45 top-notch houses that you can rent. This is my kind of place to stay when I’m on a group golf trip. Consistently ranked in the top 75 Best Golf Resorts in America it didn’t take us long to make it our home-away-from-home while we golfed the Gulf Shores. There have three unique tropical oasis pools, a fitness and tennis centre along with a restaurant and 3,000 feet of sugar white sandy Gulf of Mexico shoreline that they claim is the longest privately owned beach in AL. I have played Kiva Dunes some 25 times in the last decade or so, and I largely agree with the reviewer's comments. It is a good layout, challenging and fun to play. Kiva has had to battle a succession of weather events in recent years, and they have responded well, including redoing the greens with Champions or one of the mini-leaf type of Bermuda grasses which has resulted in much firmer and faster greens. Here is my complaint: The bunkers, specifically the amount of sand in the bunkers. I know it is difficult to keep bunkers consistent, particularly when it is a resort facility, catering to a wide variety of golfers. Still, the amount of sand in some of the bunkers (I'm referring to the depth of sand) renders some of them virtually unplayable. I'm not sure why this is. Perhaps it's to guard against the inevitable loss of sand from wind and other weather conditions. I just know that the inconsistent levels of sand in the bunkers prevent it from being a top flight course. Too bad because the layout and other conditions are very good.